Despite the cover and name of Superior Foes of Spider-Man Vol. 1: Getting the Band Back Together, the Doctor Octopus version of Spider-Man does not appear in this book. In fact, Spider-Man is only seen in flashbacks. This is actually for the best as Superior Foes is all about the lower-tier bad guys that call Marvel's New York home. It's a sequel to the pair of older Deadly Foes of Spider-Man mini-series as well as the Luke Cage-led version of Thunderbolts. All of those stories and more are called back to over the course of this trade. The main characters of Superior Foes are the Sinister Six ... sort of. They're at a five-person roster at the start of the story and they go down to three at one point, but their leader, Boomerang, refuses to use the "Sinister Syndicate" name again. Boomerang is barely a third-tier Spider-Man villain but he's the main character here. Nick Spencer explores Fred Meyers's origins as an ex-baseball player who is essentially Pete Rose if he started robbing banks. His ideas of loyalty and success are skewed but consistent. A running subplot involves his debt to the Chameleon with the price being the head of the cyborg crime boss Silvermane, a prize that Boomerang made up to get a favor from the Chameleon. This brings in other heavies like the Owl and a final page surprise that you won't see coming. Much of the Thunderbolts connection comes down to Fred dealing with his new probation officer: Mach-VII, formerly the first Beetle. Most of the classic Thunderbolts went unused in the Marvel NOW era, so Mach-VII showing up was a real treat. (As far as the name goes, even the characters point out that he apparently skipped the Mach-VI codename). His presence also illustrates what happens when villains go straight in the Marvel Universe and how their former comrades react to it. There's a new Beetle in the main cast but unfortunately there's no real interaction between her and Mach-VII in this trade. This looks to be rectified in later issues as the new Beetle's origins are revealed as part of that closing cliffhanger. While one cast member, Overdrive, remains fairly vague, the Shocker and Speed Demon act as the rest of the book's backbone. Both have been Thunderbolts in the past as well; Shocker served with Boomerang while Speed Demon was in the New Thunderbolts. Shocker, despite being arguably the best-known character in the Sinister Six, ends up being the lowest on the totem pole until the final pages demonstrate the start of a resurgence. Speed Demon is too obsessed with the Beetle to really be effective and he's the least repentant of the three former Thunderbolts. His super-speed isn't given lines like the Flash, but is rendered more like teleportation, which is made harder when his foot gets broken halfway through the trade. How he gets around this is also very un-Flash-like; let's just say it involves rollerblading. Much of the acclaim for Superior Foes of Spider-Man comes from the humor in both its writing and artwork. It can be accurately described as a villainous team book version of Matt Fraction's Hawkeye. Steve Lieber drew the Hurricane Sandy issue of that title, making the connection between the two even clearer, and Boomerang ends up looking a little like Clint Barton. Characters frequently have funny thought balloons and there's a diagram of the Owl's hideout that points out just how far a crazy criminal mastermind will go to protect his holders. The Owl is one of many characters who receive great flashback moments, and his is the best, recounting a blackmail attempt gone wrong thanks to the Man-Bull's natural talents. 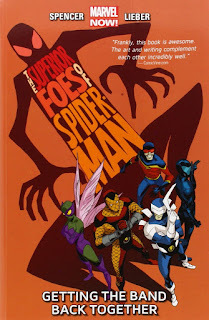 Issue after issue, Superior Foes was solicited as the "sleeper hit" of the whole Superior Spider-Man arc. I would go further and say that Superior Foes of Spider-Man Vol. 1: Getting the Band Back Together almost entirely upstaged the newly villainous Spider-Man and it would have had a wider readership had it been called either Sinister Six or Thunderbolts. It gave fans who disliked the "Superior" concept a book thoroughly rooted in classic continuity and with a unique approach to villainy. Not only was it popular enough to get its run extended by five issues, but it also earned a sequel in Spencer's Ant-Man comic. The All-New, All-Different Marvel relaunch of that book will bring it full-circle by including several Superior Foes characters in its main cast. Hopefully there's a hardcover of the whole run coming along to tie into the Ant-Man DVD release in the winter.